Most tinned dog and cat food is based on a slurry of meat or meat derivatives and cereals. Some products also contain fish. The slurry, which may be extruded, rolled or pressed into chunks, is then mixed with a “gravy” or a higher viscosity jelly, typically a mixture of starches or gums such as xanthan, guar, carageenan, locust bean, etc. in water. Other gravy ingredients could include coloring, flavor enhancers, vitamins and minerals. The processing vessel is charged with water. This may be cold or heated to 140 - 175°F (60 - 80ºC) depending on a number of processing factors. The agitator is started; the powdered ingredients are then added. As a mixture of gums and thickeners is often used these may be premixed with the other powdered ingredients. This aids incorporation of lighter powders and can help prevent formation of agglomerates. 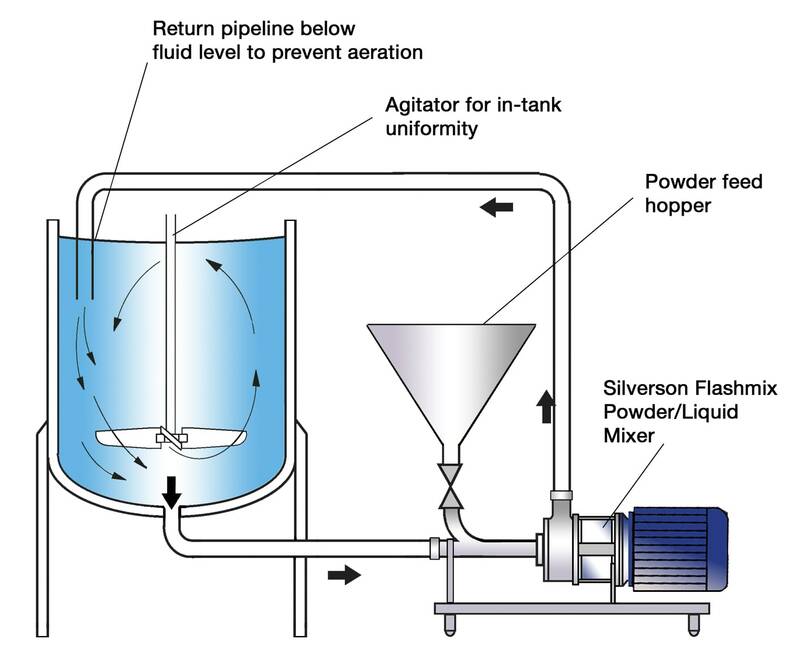 The powder mix is gradually added into the vortex created by the agitator. Mixing continues after the powders have been dispersed, to allow hydration to be completed and the desired viscosity to be obtained. Many formulations contain unnecessarily high levels of some raw materials to compensate for poor yield. Agglomerates can easily form. Agitators do not produce sufficient shear to rapidly break these down. Some gums and thickeners are not “activated” unless particle size is sufficiently reduced. A degree of shear is sometimes required to activate some products and fully hydrate them. Once viscosity increase has started, agitation of the solution and therefore powder dispersion becomes increasingly inefficient. Undissolved gum or thickening agent can gradually hydrate during storage or subsequent processing, leading to undesired changes in product viscosity. 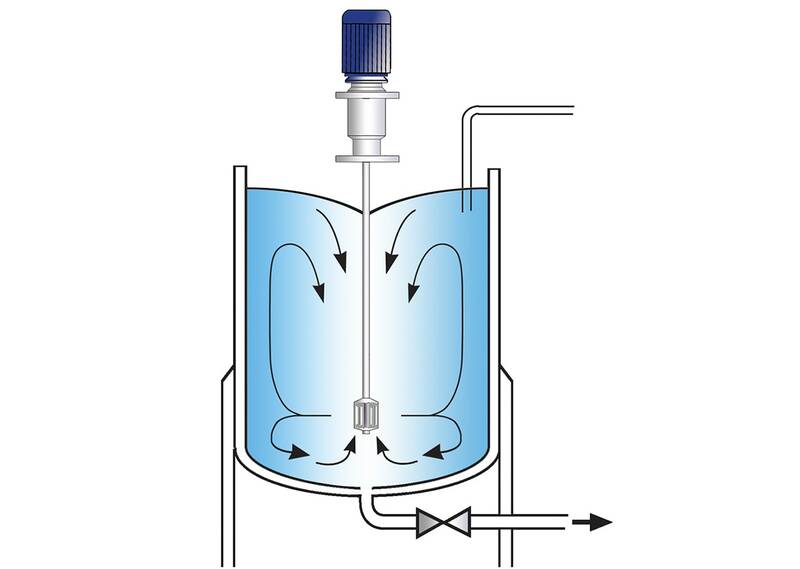 The self-pumping Flashmix draws water from the vessel into the high shear rotor/stator workhead then recirculates it back into the top of the vessel. The powder is fed into the specially designed hopper. 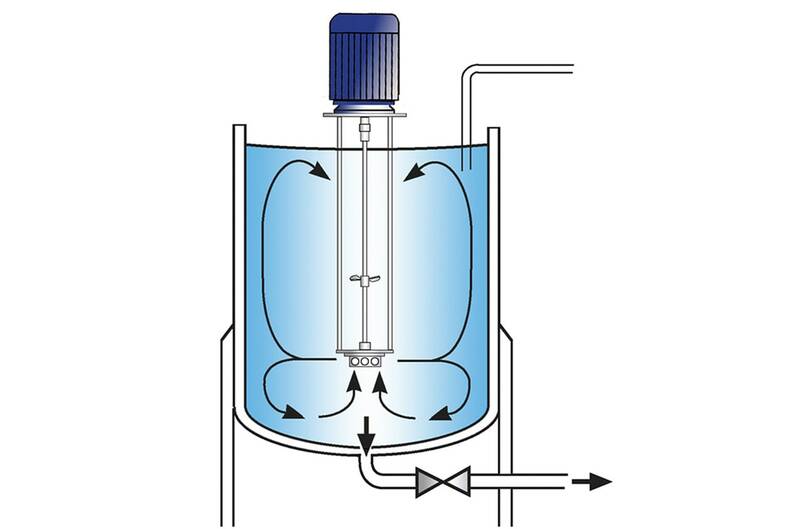 Once the water is recirculating the powder feed valve can be opened. 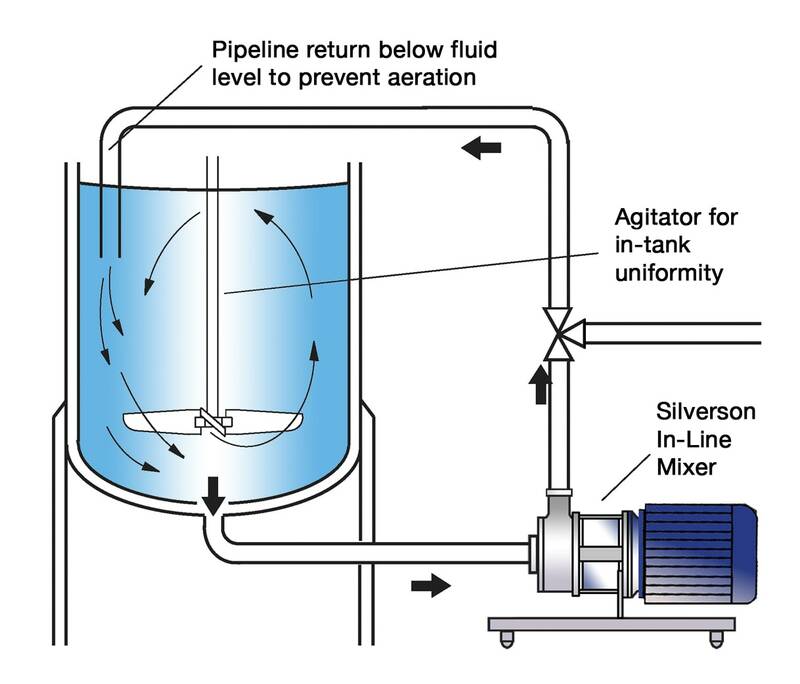 The powder is drawn into the liquid stream and passes many immediately to the inlet of the In-Line mixer. 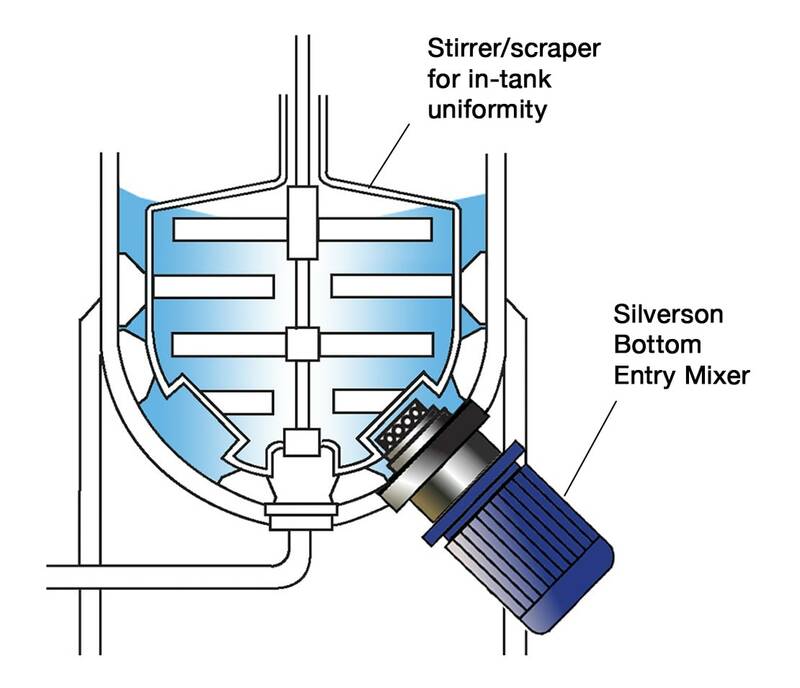 The liquid and solids are subjected to intense high shear in the workhead of the In-Line mixer before being pumped back into the vessel. A short recirculation period completes the hydration process. The greatly improved yield can allow products to be formulated with reduced gum/thickener content, cutting raw material costs. Solution can be achieved at ambient temperatures, depending on concentration and viscosity of end product.